ETECHS proudly provides services and products in: Total Security Management Systems, Closed Circuit Television (CCTV), Access Control, Perimeter Protection, X-Ray Scanners, Intrusion Alarms, Road Blockers, Explosive Detectors, Metal Detectors, Under Vehicle Inspection, Gas Detection, Fire Detection, Fire Fighting, Public Address, Master Clock, Nurse Call and Armoring equipment including Armored Vehicles, Armored Guard Houses, Bullet Proof Glass, Security Glass Films. ETECHS 500 well trained employees are always available to ensure the best solutions and services. Our highly trained engineers are fully capable in providing in-house engineering for Total Security and fire protection Solutions by integrating the above systems in projects related to our clients in Military Bases, Airports, Industrial Sectors, Power Plants, Hospitals, Hotels, Embassies, Banks, High Rise Buildings, Commercial, and Residential sectors in the Kingdom and in other GCC countries. We believe that we are Partners in Responsibility, we invest deeply in our after sales and maintenance services managed and served by our staff with excellent understanding of the importance of their roles along with excellent know-how in the systems and problem solving techniques to ensure 24/7 fully operational systems. With our Four Divisions - Security Systems, Fire Systems , Safety Systems, and ArmorTec , the Company has earned an outstanding reputation and has taken the lead in providing excellent high quality systems. Another ETECHS strengths lies in its membership in various Worldwide Security and Fire Organizations, thus, realizing projects in accordance with Internationally accepted principles of the industry. 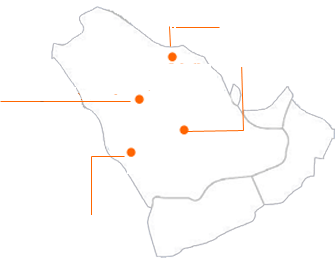 ETECHS operates from headquarters in Riyadh and regional offices in Jeddah, Jubail, and Qassim(Onaizah), We are optimistic to expand in the region with experience in implementing projects internationally with a focus on the Middle East, Asia and Africa..